New smart devices are being constantly launched, each with the ability to improve the way we live, work and engage with others. They offer different features and cater to the varying needs and degrees of capabilities among consumers. 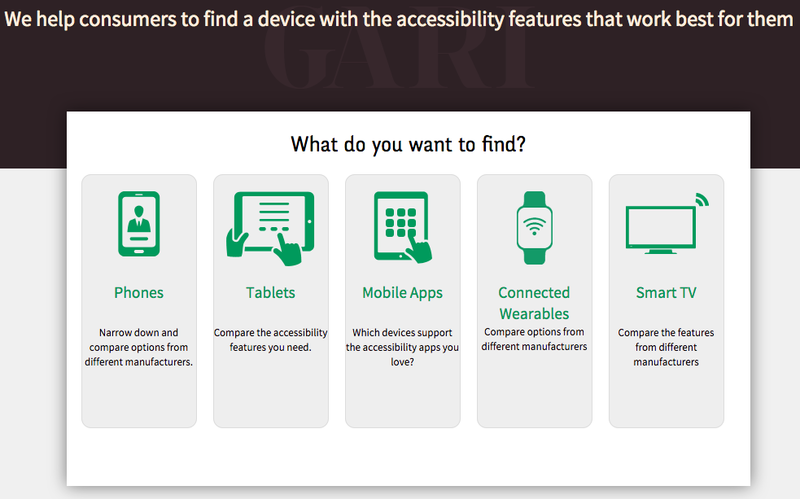 Since GARI has been so successful in providing information on the accessibility features of mobile phones, tablets and apps, we wanted to venture further and expand the GARI database to cover a range of new products. 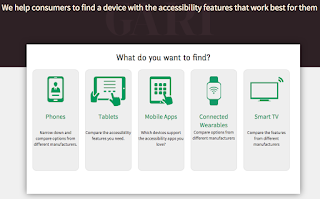 So, on the International Day of People with Disabilities, it seems fitting to invite you to have the first look at two new sections on GARI – one for Smart TV’s and the other for wearable devices. Together with our member companies and accessibility experts we worked on identifying the accessibility features of these devices, resulting in 57 features that participating companies will report against. Like mobile phones, there are many accessibility features in these devices but it can be hard for consumers to learn about which devices have which features. GARI is the perfect platform to address this need. It is the ‘go to’ information source on accessible devices and is used by stakeholders around the world. Now that we have begun the process of adding devices to these sections we hope to gradually grow both so that they will cover the majority of devices in the marketplace. We have managed to do this with GARI’s mobile phone section which today provides consumers with information on the accessibility features of more than 1,000 phones available in 16 languages. So on this important international day, we invite you to look at the site, peruse the list of accessibility features and share with us what you think. The Smart TV and Wearables sections will be subject to regular feature reviews just like the Mobile Phone and Tablet sections have been in the past. The feature list that we report against will therefore continue to grow and evolve. We really welcome your feedback and indeed this will help us ensure that GARI can assist everyone find a device that best suits their particular needs. Pictures and images are important. What we cannot imagine in our mind, we do not think is possible. When we see the upper body of a young guy on a picture, ball in his hand and in the movement of shooting the ball into the basket, we would never assume that he is sitting in a wheelchair. That is only one of many examples that Jo Spelbrink tells us about at the Accessibility Day in Vienna, Austria. His second example: the old versus the new symbol for disability. 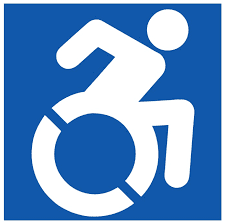 The old symbol showed a person sitting passively in a wheelchair, waiting to be pushed by somebody. The new symbol shows a person leaning forward, pushing the wheels themselves and heading off dynamically to wherever they want to go. The two pictures convey very different conceptions of disability, but if we see them every day they influence how we ourselves see and interpret disability. As Jo continues on with examples of where we are missing accessible story telling, he comes to speak of marketing and that consumers with disabilities are often lacking information. Our first assumption was that they are lacking information on the accessibility features of products and services - of course, that is what projects like the GARI database are trying to remedy. But actually no, that is not what Jo meant. His point was that the marketing itself was not accessible and that a deaf consumer like himself cannot know what commercials on TV are about if there are only plenty of nice pictures but no text. Consumers with disabilities do not only have to know about the accessibility features of products - they need to know about all the basic features and functions and properties as well just as any other consumer. Many of today’s brands and companies have not yet realised this need and potential. Companies would also benefit from rethinking their definition of target groups. Jo is deaf himself, but he has many hearing friends and business partners. In situations where he communicates with hearing people, he needs solutions that work for both deaf and hearing users. The target group for a product or service in this case is a group of mixed deaf and hearing people, not just a group of deaf persons and a group of hearing persons. A refreshing talk in Austrian Sign Language that made us aware of some of our own unconscious biases. The IFA taking place every year in Berlin is one of the biggest consumer electronics fairs. Hall after hall, manufacturers present the latest solutions for smart homes, smart household electronics, smart washing machines, smart TVs…. everything smart. While “smart” is supposed to make things easier for the consumer, it might inadvertently make devices inaccessible - especially for blind and low-vision users. For this reason, the German blind association DBSV organised a side-event dedicated to “Usability and accessibility of household and consumer electronics”, which was well attended with almost 100 participants. The heads of design and accessibility at white goods manufacturers Miele and BSH explained how these big companies are tackling accessibility, how it is integrated in the design process, how they get feedback from the disability community and what is expected from the user to make it work. An important aspect for intuitive design to have the opportunity to work, is that consumers need to be willing to experience and test new approaches. If they insist on having what they know and always had, new and better features have a hard time getting implemented. Both companies agree on two points: cross disciplinary solutions are key to achieving human centred solutions, and “adding on” accessibility at the end is always the least ideal solution. To complete the picture, Oliver Nadig from the German blind association DBSV, and Dr. Heidrun Mollekopf from the umbrella organisations of German senior citizen associations, talked about experience and requirements from the perspective of users with disabilities or senior users. Mr. Nadig gave through some concrete examples of how touchscreen interfaces and smart devices can make the use of these devices difficult, even impossible for persons with disabilities. Be it that the menus have no clear starting point and ending point and run through in a circle, giving blind users no indication where in the menu they are. Be it that there is no indication of activated functions or having functions activated at the first touch, meaning a person exploring via touch inadvertently activates these functions right away. They emphasised that from their perspective, smart accessibility means that devices adapt to the individual needs of users and remembers the necessary settings. The panel discussion concluding the event, came to three practical conclusions: 1) we need sensibilisation and awareness among policy makers and consumers - regulation is not forcibly the right solution, but can lead the way in the right direction; 2) we are lacking the necessary information about existing accessibility solutions - especially among consumers as well as among sales personal and carers; 3) we need norms and standards for accessibility to allow coherent implementation. So while the awareness of accessibility - its importance and implementation - has not made its way on the general show floor of the IFA yet, the well attended side event clearly showed that the need is there, and that accessibility is gaining in traction. Public Procurement Directive, Web Accessibility Directive, European Accessibility Act… in the context of these regulations coming into force, under revision or being discussed, Microsoft’s event on “The future of accessibility - through the lens of technology, policy and economics” brought together in a timely manner an interesting group of stakeholders. Keynote speaker Mark Pollock set the stage. He told his personal story from loosing his sight at 22 to loosing the ability to walk years later. Mark found comfort in technology that helped him overcome certain barriers and gave him back a semblance of normalcy - at least in certain situations. Following speakers in the panel agreed with Mark that one of the biggest advantages of accessible or assistive technologies is to “feel slightly normal again” and that technologies such as Microsoft’s 3D Soundscape can help filling gaps “which I did not know I have”. Microsoft’s 3D Soundscape is a technology that helps blind users to more independently, liberating movement, and facilitating “normal” street experience. Kirstie from Guide Dogs UK shared her experience with this technology and how it helped her gain back some independence and freedom. While technology can liberate, legal and policy aspects play into ensuring these technologies are available to all users that need them. The European Commission explained their motivation for proposing a European Accessibility Act, underlining that the market development in ICT over the past 20 years has failed to create a truly harmonised and interoperable offer in accessible and assistive devices. And Prof. Anne Lawson from the University of Leeds expanded on the role of legislation and policies moving accessibility forward. Equality laws have been successful in some countries to push the accessibility agenda, but she sees the greatest potential in governments using their research and innovation agendas to push for accessibility. Robin Spinks from RNIB put the question out there: why is existing legislation not enforced? If you race down the highway, you get a ticket right away, but if you infringe on accessibility obligations, there are no consequences. One possible answer: the governments do not have their own house in order (meaning they are not very good in applying accessibility rules themselves, starting with making their websites and apps accessible…. ), so they are reluctant to police accessibility implementation in general. Geoff Adams-Spink, former BBC Age & Disability Correspondent, and moderator of the panel discussions, challenged the innovators panel to speculate on what the future will hold for accessibility. The panel members came from a background of touch based and eye controlled computers solutions for special education (Tobii), dyslexia screening (Optolexia), ICT consulting (Softjam) and the Internet of Things (Univera Sade). As varied as their background were their answers: speculations ranged from wearables to cloud computing, passing by sensors and the Internet of Things. While the innovators panel was convinced that the time has come for accessibility to go mainstream - with or without regulation - some pointed out that there still is the misconception that accessibility is only to be done for compliance reasons, that there is no room for creativity. But in reality, many of the features initially developed to help persons with disabilities, have become popular features for everyone: voice recognition, image recognition, zoom, predictive text… the list goes on. Also, people with disabilities often have a novel way of working around obstacles and to harvest this intelligence and translate it into new products, people with disabilities must be included in product conception and design from the very beginning. Treating accessibility as on add-on is expensive and counterproductive. Before concluding the event, Geoff Adams-Spink challenged his last round of panelists with the question of how to best pitch accessibility to policy makers. Shaheen Parks, analyst at Forrester, answered that beyond the profit and tapping into the market power of the disabled community, accessible solutions are proven to help in productivity and optimisation. Dr. Cara Antoine from Shell would say that accessibility is simply the right thing to do - out of respect for the people. Robin Spinks from RNIB, would take several disabled friends along and invite the policy maker to use Robin’s computer to book him a flight - with screen magnification on and no way to switch it off. Then he would invite him together with his friends to a bar and to ponder about life. Robin Christopherson from AbilityNet would ask the policy maker to use his phone out in the bright sunlight and see how well he’d be able to handle that. Some good ideas we can all try out next time we come to explain to policy makers why accessibility counts. Before concluding the event, Geoff Adams-Spink challenged his last round of panelists with the question of how to best pitch accessibility to policy makers. Shaheen Parks, analyst at Forrester, answered that beyond the profit and tapping into the market power of the disabled community, accessible solutions are proven to help in productivity and optimisation. Dr. Cara Antoine from Shell, would say that accessibility is simply the right thing to do - out of respect for the people. Robin Spinks from RNIB, would take several disabled friends along and invite the policy maker to use Robin’s computer to book him a flight - with screen magnification on and no way to switch it off. Then he would invite him together with his friends to a bar and to ponder about life. Robin Christopherson from AbilityNet would ask the policy maker to use his phone out in the bright sunlight and see how well he’d be able to handle that. While the innovators panel was convinced that the time has come for accessibility to go mainstream - with or without regulation - some pointed out that there the misconception that accessibility is only to be done for compliance reasons, that there is no room for creativity. But in reality, many of the features initially developed to help persons with disabilities, have become popular features for everyone: voice recognition, image recognition, zoom, predictive text… the list goes on. Also, people with disabilities often have a novel way of working around obstacles and to harvest this intelligence and translate it into new products, people with disabilities must be included in product conception and design from the very beginning. Treating accessibility as on add-on is expensive and counterproductive. Keynote speaker Mark Pollock set the stage. He told his personal story from loosing his sight at 22 to loosing the ability to walk years later. Mark found comfort in technology that helped him overcome certain barriers and gave him back a semblance of normalcy - at least in certain situations. Following speakers in the panel agreed with Mark that one of the biggest advantages of accessible or assistive technologies is to “feel slightly normal again” and that technologies such as Microsoft’s 3D Soundscape can help filling gaps “which I did not know I have”. Microsoft’s 3D Soundscape is a technology that helps blind users to more independently, liberating movement, and facilitating “normal” street experience. Kirstie from Guide Dogs UK shared her experience with this technology and how it helped her gain back a some independence and freedom.